Using the Force feedback function. 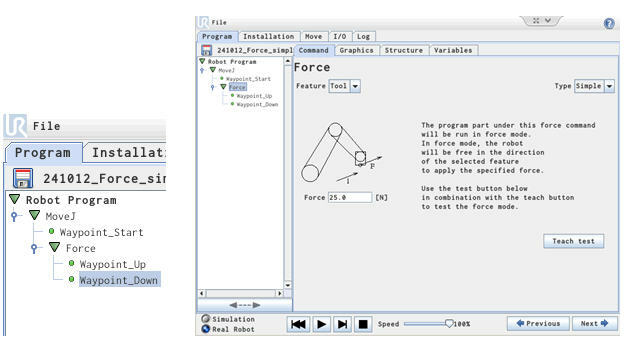 Originally the Force measurement was available as a Function for programming purpose, but since version 1.6 Force has been build in as a Programming Object to be used for the programmer. This example is the original Force measurement used as a Function. It is possible to set the robot for a task where a certain force (pressure) is desired. This is typical used for a polishing task. The Force is selected from the Function drop down menu when building the “If” statement. The robot will move from the “In” position towards the “Out” position as long the force the tool head meet is less than 60 Newton, but if the tool head meets a force greater than 60 Newton then it will retract to the “In” position before reaching the “Out” position. 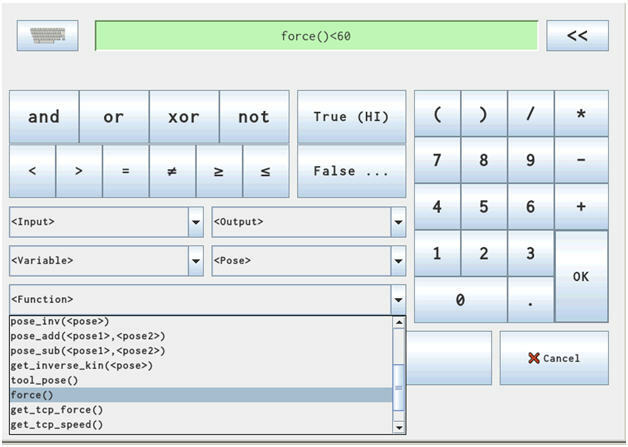 Force Function as Programming Object. This example uses the build in Force Object which is available from version 1.6. There are 4 different methods to use Force which is “Simple”, “Frame”, “Point” and “Motion” as described in the UR manual. Force Function – Example – “Simple”. 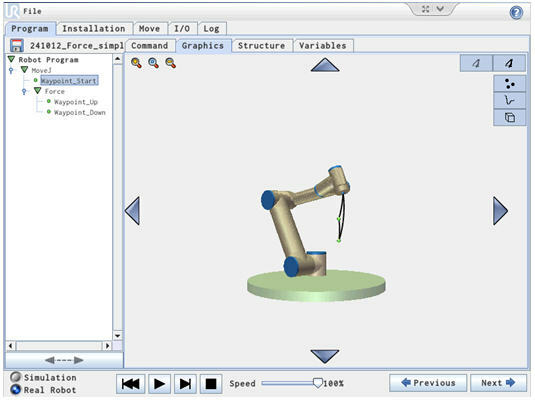 When using the “Simple” method and the Features are selected as “Tool” or “Base” the robot only considers the “Z” axis for measuring the Force. So in this case an example is constructed which moves the robot head from Up to down position and measuring the force along the way. In this method the Robot consider the Force sensing as more important that the actual position of the tool head. Therefore the path seems random when applying a force to the tool head -and there is a risk that the Robot “gets lost” if no force is meeting – or the time to the next waypoint is set very high. In this example the robot starts at its starting position and go to the “Up” position. The Waypoint_Up and Waypoint_Down is under the Force command and therefore the Force is measured during the downwards movement. The Force is set to 25 Newton and the Feature is set to “Tool”. The Force type is “Simple” in this example. When the Robot meets a force of 25 Newton the Robot will maintain this force in the downward direction (“Z” direction). When the time is up as set under the Waypoint_Down property the robot will go back to its starting position and run the cycle all over again. If the Waypoint_Down “Time” property is set very high e.g. 100 seconds – the robot will maintain the force at 25 Newton for 100 Second, but if the Object that resist the Tool head is traveling downwards – the robot can get lost because the tool head position might skip past the Waypoint_Down position and continue its downwards movement, but then eventually will stop with a Safety stop. The Robot has stopped with a Security Stop because the Tool head has past the Waypoint_Down position – and the time is still not up – so the robot will keep going downwards until it meet resistance or make a safety stop. In reality this will hardly occur because there would be an object that the robot is meeting e.g. when polishing, and therefore the robot would not be able to travel that far down wards, but it is a matter to consider. Notice the Time is set to 100 seconds. Force feed back and Safety stop. The UR robot is equipped with a Safety stop when the robot meets a force that is 150 Newton (approximate 15 Kg). Since there is a safety margin the value is actually lower than 150 Newton in order to ensure that the robot complies with this ISO standard. On the other hand the robot has a lifting capacity of 5 Kg (approximate 50 Newton) so the safety stops cannot be lower than 50 Newton. So the actual value is between 50 Newton and 150 Newton. I am planning to program my UR5 (CB3) to read the force/torque from FT300 and instantly adjust the force/torque needed at the end-effector. I figured I need to use the script to establish a communication between force sensor and the torque generated in each joint. Any pointers, comments or website is appreciated. Since the FT-300 is a Robotiq product – then maybe consider to contact Robotiq. Thanks for your reply. I managed to read the FT300 output, yet I wondered if there is any way to change the joint torques instantly as the robot moves through a certain trajectory. Maybe the “Speedj” or “speedl” commmands can be considered. I’m trying to read force values (Fx,Fy, Fz) from Modbus. How can I do that. Which register should be read to get the corresponding force values? I’m working with UR5e. I have not seen any documentation for the force values stored in a MODBUS register. Thank you for your reply. Is there an alternate way to read force values? May be using TCP. The data from the UR controller comprises of the force values in data packet 7 but I’m not sure how to read them. We are currently starting a project that involves some development with the UR5 robot. At the moment our force transducer data goes to a computer, and we could distribute to other peripheral with python (e.g. feedback the data to the robot), but we anticipate that might be unpractical, because of processing time, for a smooth movement. Maybe an optimal solution would be modifying the source code of the controller box. We are aware of the existence of a force (1) and force feedback modes (2), but these functions seem to work exerting the force in the same direction as the robot movement, and most likely working on the CB3 and we are using the CB2 model. - Do you have any experience or idea about this kind of development/implementation with URs? Any help or comment is greatly appreciated, many thanks in advance for your time. The CB2 with software version 1.8.14035 does also have the build in UR force function. I know Robotiq have an application for UR robot UR Caps that uses the Robotiq force torque sensor in 6 dimensions. to figure out wich Robot is the best for us i would like to know what are the maximum TCP forces for UR3 and UR5. I cant find any difference in the manual. Do both have a maximum force around 150N to meet the safety requirements of collaboration? I expected the UR5 to be able to apply a higher force at the TCP because it got more powerfull joints but maybe iam wrong. The robots specification is given in “Payload” 3 kg and 5 kg and 10 kg. Then the robot is designed to be able to stop if it meets unexspected force – so the UR5 and UR10 is not designed to be able to apply higher forces – because the safety circuit is important to stop the robot. It is possible to use the robot to apply force, but these forces are low and can be different depending of speed – mature of travel and angle momentum etc – so the robot might stop at lower force is some situation compared to other – because of the different nature of movement. I’m having a PC running on socket 30002, who controls everything. I get the normal feedback results (as ~1400 bytes, by pulsing the connection on/off) . I get all my robot “state”-values (emergencystop pushed, programrunning, power on etc) from the list, but force mode values (robot message type 7) is no where to be seen (but almost all other message types are). I’ve also tried socket 30003, but these results doesn’t seem to correspond to the manual (excel-file, 30003table). Is there some settings i can/need to change in order to get these results? Or is it a way I can make a polyscope program who runs simutaneously, and just ask for the force with strings? Maybe your idea about making a Polyscope program and setup a Client-Server application that reads the force which can be send over the TCP connection. More informations about a Client-Server application at this link. i use the force mode (frame, tool) on a UR 10. I want the tool to move in positive Y direction until a maximum force is reached and then stop right there. Y direction. Why is the UR not stooping right there? There is one waypoint (that is 25mm in positive Y Direction in relation to the start point) in the force mode to give the direction of motion along the axis where the force is to be applied. The Target is at 30mm in positive Y Direction in relation to the start point. I tried to set the waypoint behind the target but got the same result. UR touches the surface and goes back in negative Y direction. It might be because the Force mode is not designed for precision. The Force mode is intended for applying a force when doing tasks such as polishing or deburring where it is important that the robot apply a certain force, but not focus on precision. Maybe it can be considered to use the force function as shown at this page with for example “If force()<60", but this also have some limitations. So it might also be considered to use an external force torque sensor. I am trying to achieve the exact same thing your describing. Do you think you could share your solution or maybe send me your project? At the Moment I’m trying to use a UR10 Robot to set up a measuring head onto a surface. Is there a possibility to use the Force mode to align the measuring head perpendicularly to the surface? I have not seen such function. Do you know any other function with a Chance to do this? Maybe an external force sensor can be considdered. We have an FT300 from Robotiq. That one is compatible with UR robots – so it should be possible to build a program based on such inputs. I want to use an UR10 for an assembly application. After mounting the part I want to test, if the assembling was succesful. Therefor it is important to measure the tcp-forces. Is there any official documentation, what the minimal measurable forces are, because I assume, that the forces will be pretty low. In order to get more preceies measurements in the sub Newton range then an external force sensor can be considered. thank you for the answer. I will consider using an extreral sensor. I’m trying to use the UR10 robot to touch particular points of a planar surface, of which I know the cartesian coordinates x and y. The robot has to move its tool on the z-axis until the plane is found and then come back. Is it possible to use the “movep” command in force mode? I am currently working on a UR 10 robot and I am trying to implement a force control on z axis using “Tool” function and “System” modality. The robot tool is equipped with a palette knife and it is moving in the plane by keeping it a little tilted, so that the tool is not perpendicular to the plane. In this way, during the force control the palette knife is not always in contact with the plane but, sometimes, the tool moves up. How could I manage this problem? I would be grateful if you could look into this matter. Have you tried the other methods of force function e.g. towards a point ? I’ve tried it but I get an error: “force mode: too close to the point”. Where can I find some more informations about the “toward a point” modality? I want to measure the force through 3 waypoints (the force at the tcp at these 3 waypoints)where the tool only moves in the y direction.Which method shall i use?Currently i am using type motion and selected the y axis.But i dont know how much Newton force should i mention in the force box and how to measure the forces.is my method correct? There are different methods that can be considered. I Frame mode it is possible to set the axis (e.g. Y axis) that the robot comply to. In Simple mode the robot comply to the Z axis, but the tool head be possible to turn so the robot Z direction is in the “user Y axis”. Or construct a “IF” condition like shown in the example on this page e.g. If Force > 70 then “do somethng”. The amount of the force to set depends on the amount needed in the application maybe a value of 70 or -70 can be tested depending on the direction of force compliance. First of all, I would like to describe my program. I’m using the force function (like the first picture above of 60N) to seek aluminum plates. So, the line from the start seeking force point to the stop seeking force point is oriented about 60° down. I put in the “if” statement this condition (force()<30), if there is no force met then it will retract to the start seeking force point else the robot will go to another "waypoint". (I mention that the tool weighs about 3.7Kg without plate and 4.7Kg with the plate, these were configured). During my test, I often notice on the log this warning "C114A0: High Measured Force Warning" and sometimes I meet "Security Stopped – Force limit protective stop". It's a big problem for me and I'm looking forward to resolving it! Thank you very much for your time and I'm looking forward to hearing from you. I assume the warning messages happen when the tool meet the plate and not in open air. It might maybe high speed at contact that causes the messages because at time of contact the force momentarily is over the limit for the safety setting – so although there is the “If” statement – the time is too short before the safety stop happens. Since the robot is a collaborative robot it will also monitor the force and stop according to the safety setting if the force is too high. Thank you very much for your quick reply! So, I will test the verification phase with a low speed and see the results. I noticed in the UR5 manual that it mentions that you can use Frame force control. My end goal is to be able to control the force of each individual joint from a python script. However, I do not see any URScript commands for setting force, just reading TCP or joint forces. Do you know if there is a way to set the torques at each individual joint through URScript? I am not aware of a method to set the torques at each individual joint through URScript. Thank you for the quick reply! I was able to find the force_mode function in one of the manuals I came across. Do you know of or have any examples of using that function? The help is greatly appreciated. The command I have experienced and used is the force() command with example shown on this page above. I have not used force_mode. I am working on a project that requires the UR5 robot to hold a sanding tool moving horizontally (200mm) on a surface, while applying a force (5N) on this surface (to be sure that the surface get sanded). Also, would it be possible to show others force function examples just like you did with the “simple” method. It would help me a lot to know what’s the best for my application. Thank you for your tips and all the help you provided. 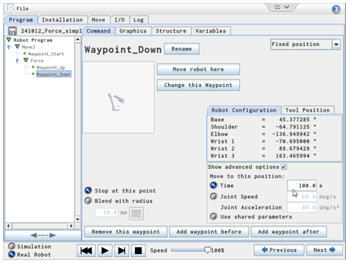 To make a horizontal move after the robot has reached the waypoint_down and meet the set force – then the next waypoint in the program under the waypoint_down (maybe called waypoint_left) can be in the desired horizontal direction from the waypoint_down. And after reaching the horizontal position the “up” waypoint can be outside the force routine. Then the robot will travel horizontal towards to the waypoint_left while applying the set force. Simple: The force is applied in tool Z direction. Frame: Multiple axes in compliant force mode. Point: The force is towards a specific feature point – for example towards the center of a perfect circle. It seems like it is the Simple mode that fits your application. -	Can someone confirm whether the behaviour / errors we have observed is actually the expected behaviour? -	We have the feeling there is some filtering between the UR5 internal force reconstruction and the command (because is external force sensor returns a smoother signal than the internal sensor). Do you know how the control law works internally? -	I guess these errors are coming from the way the force is reconstructed using the motors intensity, right? The internal force function works great on those applications where I am using the function. If you need very precises measurement then an external force torque sensor can be used like this one from Robotiq. I want to know if there is no tool attach to TCP, is it possible to know which forces is apply to the robot? and how the robot measure these forces. If no tool and nothing touching the robot then it should be gravity that apply to the robot. The robot measure this by current in the joints. The orientation and when there is a tool mounted this can be set in the installation setup in order to tell the robot in which direction to expect the gravity force. Thanks for your Answer. I ask because when i got the vector force from the port 30002, it is always [0,0,0,0,0,0]. I have no tools on flange. Is it normal ? Which command did you use ? Or how did you retreive the data ? I have done a socket connection with robot on secondary port. I have cheked other data like tcp pose or joints position its corrects according to values on smartpad. Is it a real robot or simulator ? I try both on the real an simulator. I try to get the external forces apply to robot when it is doing some stuff. Do I need to put the robot in the force mode before? I have no informations for that – maybe some other on the forum has some expereince using this. I will wish to use the command ” FORCE” on the UR10 for control the moment RX and Ry but always applying a force in the axis Z. This goal is to make the robot compliant on shape. Is it possible ? I try to put values in the window “Strength” in Rx and Ry, but when I run my program, the robot no longer keeps its main path. I wish the robot paths adjusts to the shape of a part. Are you using the software version 3.3 and the “force_mode” command with parameters given ? 1) Is it possible to get a real time readout of the amount of force the robot is applying during the MoveL command? 2) Is it possible to code it such that when the force readout drops below a certain threshold that the robot stops, even if the MoveL is not completed yet. (This should indicated that the drill bit has broken thru the wall). Yes it is possible to get the force result by using the force() function as shown it the example you have been looking at and the robot will retract as soon this force is reached. You can also read the force when using the force() function is a Thread (which is a parallel program) to assign a variable. However I think the 3mm is a very small margin because a drill application will often carry some inertia and momentum so whether this momentum can stop in 3mm test might show – maybe if a very slow drill movement is chosen is necessary. I would like to program the our U5 robot that it can lift a certain material with more power then in the safety mode. I was testing the force comand in the downwards direction but can`t get control over the movement yet. Unfortunatly the robots movement gets very fast and stopps in a security break! As the UR is a collaborative robot it is not intended to use beyond the safety settings. What is the minimum distance Universal Robot Can move in single direction??? In the terms of the MKS unit System. The parameter provided related to position and movement is Repeatability which is 0.1 mm for Universal-Robots. I have a question. I want to code the robot, that if the force the robot has to use to place a piece, is higher then for example 50 newtons, it has to put it somewhere else. I tried that with an if statement. And into that a force()>50 condition. But the robot doesn’t seem to care. Can you give me an coding example on how to program that correctly? Yes your approach is correct, but I think you need to go a little higher in force maybe force()>50 or higher because when the robot is moving there is a inertia force that influence the measurements because the robot has mass – my experience is that this function can be used in the range 60 – 100 newton because when it becomes higher then the safety stop kicks in. The example on this page is using this method. If you need more accurate force measurements then you may consider an external force torque sensor like this one. is there a posibillity to get just the force in e.g. z-axis? With force() I just get the norm from get_tcp_force(). For example, i want the robot to move till he hit a maximum force in z-direction. If the robot is only moving in Z direction – the force experienced should only be force in Z direction – provided no external objects are pushing or pulling the robot in another direction. Thank you for your reply. Your answer is quite useful. I also want to know how about the Measuring range? I have a question that if I can get the real-time force curve? I use the Robot to drill holes, and want to get the force curve to investigate the hardness of the material. 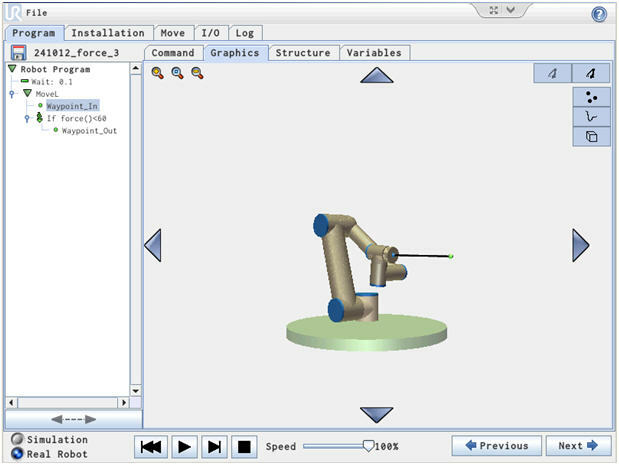 The build in force sensitivity to be used in programs depends on the pose of the robot and is around 1 – 5 Newton. If you need better resolution you might consider mounting an external force torque sensor. As we know, the UR5 robot can lead to a safety stop when it measures a force which is larger than about 150N. Can we change this limitation to a larger or smaller value? such as 100N? If we can, can you specify how to do this? Thank you! At the moment you can make a small program routine that lower the force detection point. Thank you for your reply. Your suggestion is good and useful. But what I meant is if we can make such setting directly in the system? somewhere in the robot setting? No it is not a setting – you can make it as part of a program. recently I am using the function get_tcp_force(). But what i find is weird. When I use the function without any payload and the robot is not moving, the forces I get from the function are not stable. They are changing. But The variation is not big, so I accept that. But if I move the robot and move it back, the force i get is very different from the previous. For example, I move the robot along the base y-axis and move it back. The y-axis force after the robot is back is so different from that before the robot moves. I mean, the positions are the same, why it detects different forces? My experience is that the build in force function (when used in a user programs) works best in the range 70 – 100 Newton with steps of approximate 5 Newton. Below that the force is too small to be measured due to inertia and above that is near the range where the robot might stop. If you need fine force measurements then you might consider mounting an external force sensor.